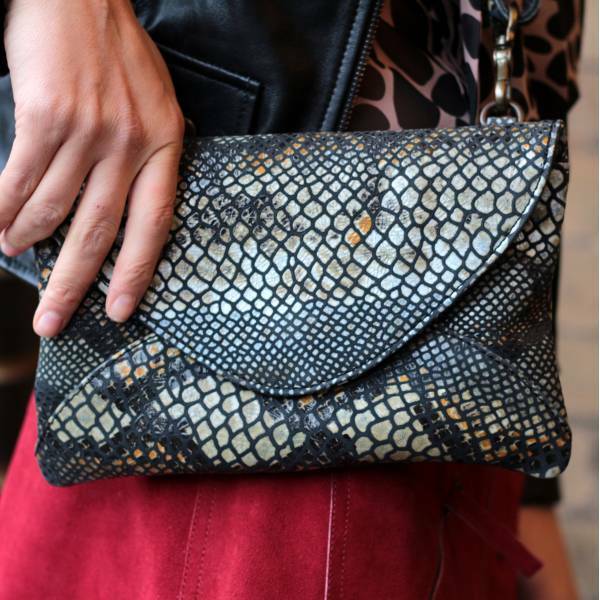 Leather clutch bag in snake effect or snakeprint leather called Sligo. It's a beautiful leather, strong and durable but still soft at the same time. It has a long adjustable and removable strap and a removable wrist strap creating maximum versatility. Format 24x15cms it will hold all your essentials and with a zip pocket built in the lining so you can separate your items inside. The extendable measures from 78 to 140cms. The lining is black waterproof and lasts and lasts and lasts. This bag is beautifully crafted and the snake design is just the best we can come up with.